In order to do good load balancing Task Manager (TM) have to handle all requests for new job (that must be added to list B). Let's assume there is about 1 new job, for every currently processing job. So TM have to handle N times more requests, than usual core (N - number of cores in the system). Imo this is not scalable approach. With 1000 cores, TM have to be 1000 times more powerful than usual core. And TM must handle 1000 connections (as far as I understand, every core directly connected to TM). And TM really have to do *very* good load balancing. 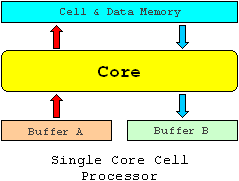 Since all cores have to wait for most loaded core to complete in order to shift to new system cycle. Thanks for the intelligent comment. You are absolutely correct. The task manager design is not scalable as shown. I have a simple solution that splits the task manager's job among the cores but, unfortunately, I cannot divulge it at this time. All I can say is that the trick is to keep long distance comunication between the cores to a minimum (nearest neighbor is best) and to eliminate it altogether whenever possible. 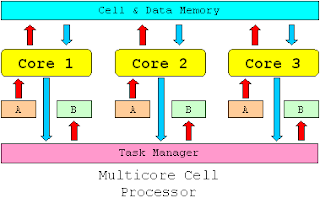 This is possible because the cores do not have their own private caches. As far as cores having to wait, I don't think this is a problem because load balancing will be pretty much perfect. The virtual cycle is essential because that's what enforces temporal determinism. Without deterministic timing at the instruction level, there can be no software reliability. I'm creating software system similar in some senses. It uses signals on high and medium levels, and plain-old-algorithms on low level. And it allows sufficiently fine-grained work distribution and balancing. 1. Really distributed (i.e. scalable) with "best-effort" load-balancing. 2. Fully centralized (i.e. not scalable) with "perfect" load-balancing. In order to support system-wide cycles you have to have "perfect" load-balancing. So... it will be not scalable. In my system I find "keep long distance comunication between the cores to a minimum (nearest neighbor is best) and to eliminate it altogether whenever possible" as the only answer too. But in my system "best-effort" load-balancing is admissible, because I don't have system-wide cycles. So core can be just idle, and this doesn't affect system performance much. Well, in my opinion, 100% perfect load balancing would be possible only if all CPU instructions had equal execution durations. However, given a high enough load per cycle (which is what we want in a fine-grain parallel system), the wait periods are negligible. Using the solution that I have in mind, the TM becomes somewhat like a ring communication network. A good metaphor is to think of it as a pair of sieves (A and B) where each core represents a hole in the sieve. During every cycle, one sieve is filled with jobs (fine grained instructions or cells) that need to be processed through. What makes this approach interesting is that the sieve needs to be shaken just a litle in order for all the grains to make it through the holes. The idea is to keep the surface of the grains level. In other words, no grain has to travel far before finding an available hole to fall through. Most of them do not travel at all. This is all I am at liberty say on the matter for the time being. Sorry.